Other Products by BSN. Search other Protein Powder products. FRESH NEW LOOK - SAME GREAT PRODUCT! **Cost per serve represents 45 serve only. Introducing the best tasting protein: BSN Syntha 6 EDGE. This might very well be the the Number 1 Tasting Protein on the market today. It tastes so good that you’ll think it’s a cheat day every every day, and forget about all of those boring shakes you’ve had in the past. BSN Syntha 6 EDGE not only tastes amazing but has a better macronutrient profile than its predecessor. This nutrition-packed product delivers a good old-fashioned milkshake flavour with 24g protein per serve, only 6g carbohydrates and a mere 153 calories. 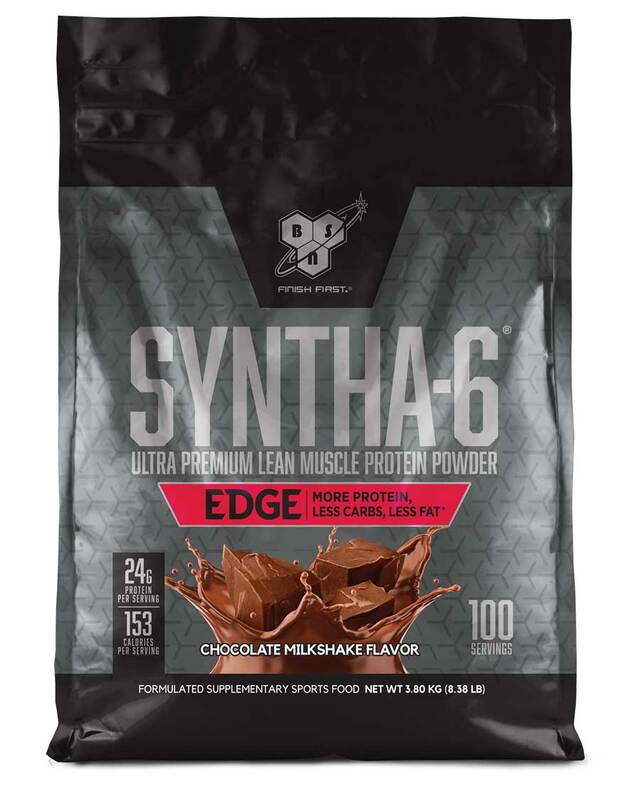 Delivering a blend of fast and slow acting proteins, Syntha 6 EDGE will support muscle recovery and boost lean muscle mass gains. Whey Protein has the highest biological value of any protein yet discovered. In fact, it is one of the few protein sources that have been discovered that has a higher biological value than egg protein. For many decades, egg was considered to be the best source of protein, due to its high concentration of essential amino acids. Fortunately, BSN Syntha-6 Edge contains loads of whey protein, as well as some casein protein. This makes for an ultra premium protein blend. Casein is the other protein found in milk, apart from whey, and also has a great amino acid profile. Whey protein has been shown time and time again that it stimulates protein synthesis very well. And why would you want this? Muscle protein synthesis is the laying down of new muscle tissue, which is a boon when it comes to healing after a heavy gym session. Fuel your muscles and explode your taste buds with Syntha-6 Edge. With a macronutrient profile that has removed the excess fats and some carbs too, you can be sure that you’ve got a great tasting protein powder that will reward you any time of the day. We thought these products were fantastic, and a great idea for anyone who knows just how delicious the standard Syntha-6 is, but needs something a bit leaner on calories. We found the flavours to be a little less intense than the standard Syntha-6, but this was to be expected due to the difference in calories between the 2 products. 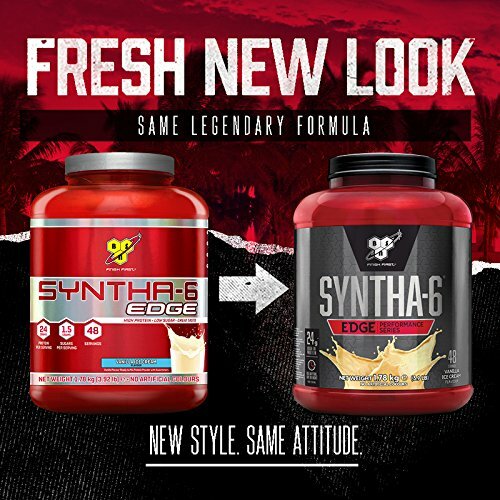 BSN Syntha-6 Edge Vanilla was definitely a standout flavour that we really enjoyed, and still enjoy! It seems like to might even have a hint of butterscotch mixed in with the gourmet vanilla flavour. Really tasty stuff. Though BSN Syntha-6 Edge Cookies and Cream is always nice for a change, nor could we complain about any of their others flavours either. They're just too nice. Syntha-6 Edge is great in cold water, or if you can spare the extra calories, try it in full cream milk for a more gourmet flavour. There is only a 13 Calorie difference per serve between these two products. BSN Syntha-6 Isolate contains 2 grams less fat per serve, and 1 gram less of carbohydrates, which is not a great disparity. The Isolate product contains some milk protein isolate, so it is not a pure whey protein isolate product. In fact, both of these products contain whey and casein as their sole protein sources. So there is not as much difference between the two as we would think. If you’re counting every calorie on a strict diet, then Isolate is probably the way to go. Otherwise, Syntha-6 Edge is better priced has has a great range of flavours to choose from. Is BSN Syntha-6 Edge Gluten free? If there was gluten in this product, BSN would need to declare it as an allergen. However, there is only a declaration for Milk and Soy on this product. This product does not state “Gluten Free” on the packaging, however, so those who suffer with extreme gluten sensitivity or celiac disease should be cautious, as it could contain traces of gluten. INGREDIENTS: Protein Matrix (Whey Protein Concentrate [Milk], Whey Protein Isolate [Milk], Whey Protein Isolate Hydrosylate [Milk], Milk Protein, Micellar Casein [Milk], Milk Protein Concentrate), (Emulsifier: Soy Lecithin), Creamer (Sunflower Oil, Corn Syrup Solids, Sodium Caseinate [Milk], Mono- and Diglycerides, Dipotassium Phosphate Tricalcium Phosphate, Soy Lecithin, Tocopherols), Natural & Artificial Flaovurs [Milk], Soy Lecithin, Thickeners (Carboxymethyl Cellulose, Xanthan Gum, Carrageenan), Salt, Sweeteners (Sucralose, Acesulfame Potassium).